Blood oranges have such a short season, I feel it’s imperative to make the most of them. They have a wonderful flavour and are not overly sugary like some oranges can be. They also have a gorgeous blood red colour. The colour is lost in this bloody orange chocolate cake, but the flavour is there. I’ve been testing out the Optimum Induction Pressure-Cook Pro recently. It’s an amazing piece of kit and functions as a slow cooker as well as a pressure cooker. It stews, steams, roasts, deep fries, braises, defrosts and much more. I’ve made porridge, yoghurt and rice as well as this veggie bean chilli. This quite astonishing multi cooker can also bake cakes. I decided to test this particular function out with a blood orange chocolate cake. Unlike the last chocolate cake I made for Jumpstart 2017, this one is not vegan. It’s not what you’d call a healthy recipe either. But it’s healthier than most cakes. It’s made using organic wholemeal spelt flour, organic 85% dark chocolate and unrefined sugar. Just don’t dwell on the amount of sugar; it’s a little eye watering The ingredients together with the cooking method give a beautiful moist fudgy consistency and wonderfully intense chocolate orange flavour. It would be perfect to give to someone special on Valentine’s Day. Red is the symbolic colour of love after all, even if it can’t be seen. The blood orange chocolate cake has the added bonus of being super easy to make too, either in an oven or in the Pressure-Cook Pro. My mother in law has recently passed away. She had a very sweet tooth, so it seems fitting somehow to post this fudgy blood orange chocolate cake on the day of her funeral. A beautifully fudgy chocolate cake with an intense chocolate orange flavour. 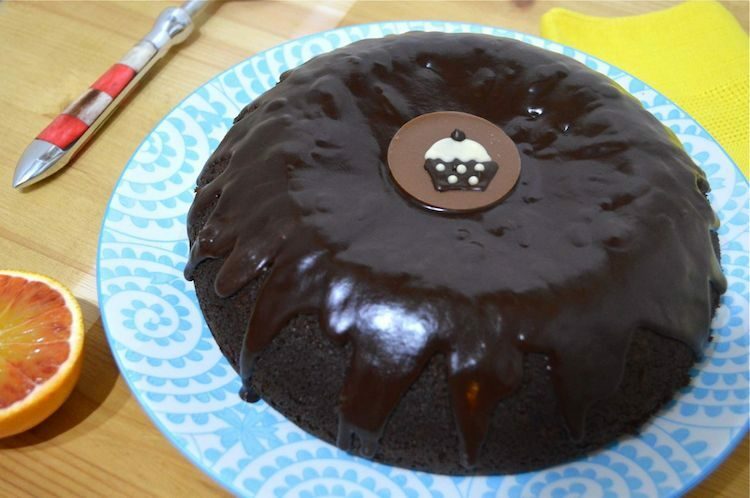 The orange chocolate glaze isn't necessary, but adds a festive air and tastes delicious. Melt butter, chocolate and sugars in a large saucepan over a very gentle heat, then remove from the heat. Grate in the zest of the orange, then squeeze in the juice. Stir until everything is combined. Mix the bicarbonate of soda into the flour and sift a third in. Fold in, then stir in a third of the hot water. Repeat until everything is just mixed. Pour into a silicone mould, lined tin or a buttered / oiled Pressure-Cook Pro bowl. Bake for 55 minutes at 180℃ in the middle of the oven or until the top is firm and an inserted skewer comes out almost clean. A slight underbake is much better than over baking with this cake. If using the Pressure-Cook Pro, select the cake function and adjust the time setting to 1 hr. Leave to cool, then turn out onto a serving plate. Squeeze the juice of an orange into a small pan. Add the honey and chocolate and melt everything over a gentle heat. Alternatively place in a bowl over some hot water. Add the butter, half at a time, stirring until melted. Pour over the cake, allowing it to dribble down the sides. Other oranges can be used, but the flavour and sweetness of the cake will vary. This is my entry for this February’s We Should Cocoa. If you’ve made anything where chocolate is a main ingredient this month, do join in. I’m also sharing this blood orange chocolate cake with Ness at JibberJabberUK for Love Cake. The theme this month is Cakes for All. You can keep up with the Jumpstart 2017 campaign by following me and other Froothie Ambassadors via the hashtag #Jumpstart17 on Twitter, Facebook and Instagram. As a Froothie Ambassador, I can offer Tin and Thyme readers free P&P on any Froothie appliance. Add 2483 free ambassador delivery to the comment box when ordering to get free postage and packing. Delivery will be credited back onto your card. The Optimum Pressure-Cook Pro is currently on offer at £199. Blood Orange Chocolate Cake. PIN IT. 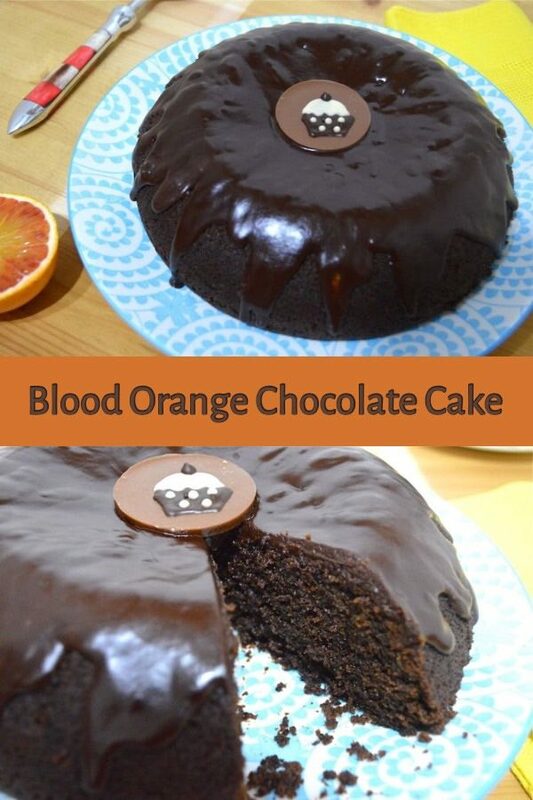 If you make this blood orange chocolate cake, I’d love to hear about it in the comments below or via social media. A photo would be good too. For more nutritious and delicious recipes, follow me on Twitter, Facebook, Instagram or Pinterest. Just bought some blood oranges to make some salads for the dinner. I love them and usually just eat them plain..should do more in the baking! Your chocolate cake looks sensational! Great title for this post – I would love this cake – though yes lots of sugar! I always find it hard to think how to feature blood oranges and keep their colour – that is a real challenge! Sorry to hear about your mother in law – warm wishes to you and CT’s family. Thanks very much Johanna. It’s always hard losing people you’re close to, but she lived a good and long life. Thanks very much Sus. It’s been an emotional week for sure, but cake helps! Ah this sounds so good. I love blood oranges and like Janice I really love the flavour that molasses bring to a bake. YUM. Thank goodness blood oranges are easier to source than they used to be. This cake looks sooo moist and delicious! Thanks Kavey, it was so good, even though the colour is hidden. Thanks Sarah. It’s not an easy time to be sure and so much to do and sort out, but I know my Mother in Law would be very happy to know we were enjoying cake. Such a stunning Cake Choclette – and well, I adore anything made with blood oranges! Thanks Ceri, blood oranges are so very special. And I’m not disappointed. The cake looks to die for…… Such a wonderful texture and perfectly rich. The addition of blood orange (which I agree have to be enjoyed in abundance whilst they last) is brilliant. It’s amazing and it gives true cake such a lovely texture. I was impressed. This looks IMMENSE! Can’t believe you made this with a pressure cooker! Yes, quite astonishing. The cooker gave it such a gorgeous texture, I’ll be using it for cakes again. Omg I love blood oranges. I’m useless at cakes, but I definitely want to give this one a try!! I sorry to hear about your mother-in-law. This seems a very fitting and seasonal tribute to her. Thanks Ness. It’s never going to be easy losing family and friends. I was impressed with it too and it gave such a good texture to the cake.